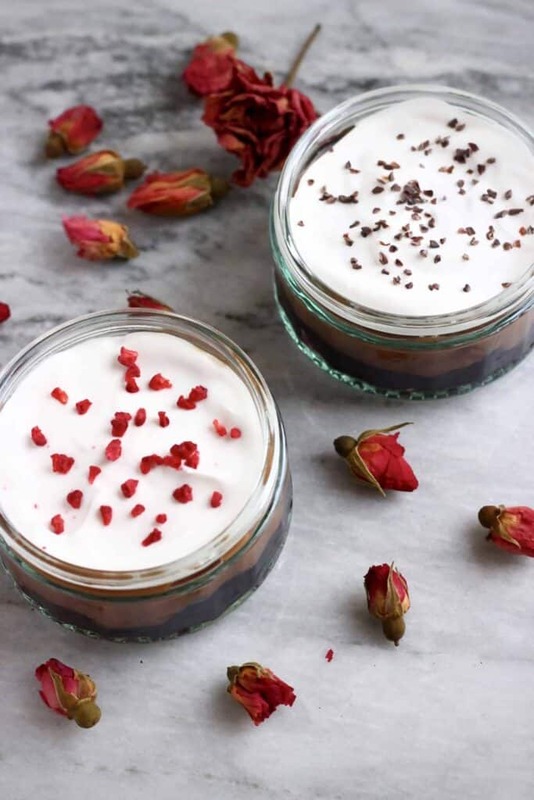 This Gluten-Free Vegan Chocolate Cherry Trifle is so easy to make, super delicious, and perfect for the festive season! It was inspired by my Strawberry Trifle recipe, but this one is a slightly more Christmassy version! 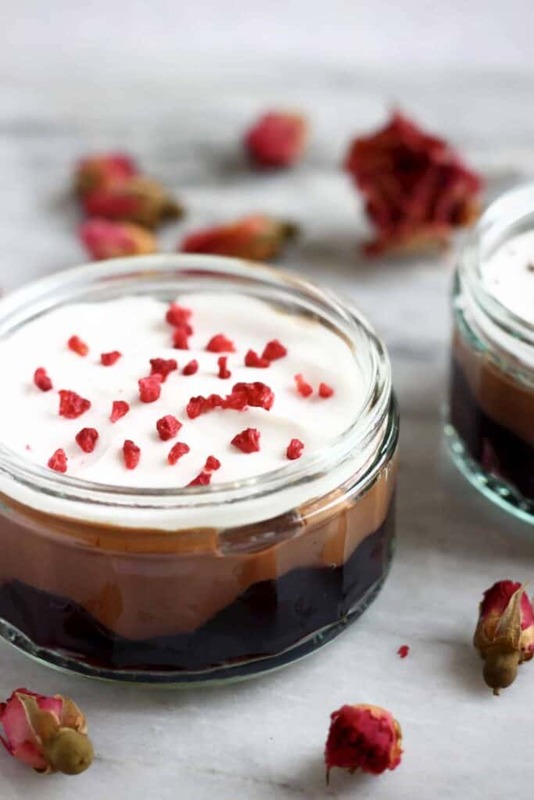 I absolutely love the combination of the sweet and slightly boozy cherry jelly, gorgeously rich chocolate custard, and light, fluffy coconut whipped cream. The bottom layer starts with a tin of cherries in syrup, then all you need to do is add some agar to turn it into a jelly. 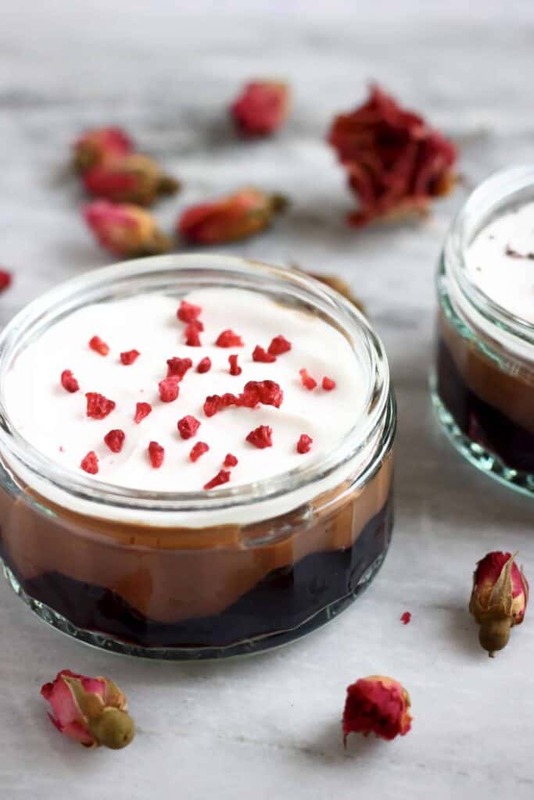 Not only is agar vegan-friendly, but it’s also happens to make them much healthier, too! Agar is a natural jelly-like substance that comes from algae that grows in the sea. It was first discovered in Japan in the 17th century, where it is known as kanten. It’s very healthy as it’s around 80% fibre. You will be able to find agar flakes in most local health stores or Asian supermarkets, if not your local supermarket. 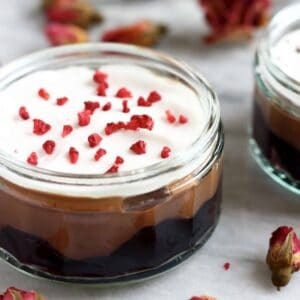 I decided to make a chocolate custard, because chocolate and cherries are such good friends. This custard is super easy to make and delicious enough to be devoured by the spoonful. My secret for making it taste delicious without the richness of cow’s milk is this unsweetened cashew milk that I’ve absolutely fallen in love with. It’s become my go-to milk for making hot drinks because it becomes deliciously rich and creamy when it’s heated up. So I decided to use it for this custard, and it didn’t let me down! I then used coconut whipped cream for the topping. If you’re pressed for time, you could use a thick coconut yogurt instead, but I’d really recommend making your own coconut whipped cream because there’s no sour, yogurt-y flavour, and it’s much lighter and fluffier. I like to add some vanilla bean powder for extra flavour and add some maple syrup to sweeten (you don’t need very much though, as the coconut is already very naturally sweet). 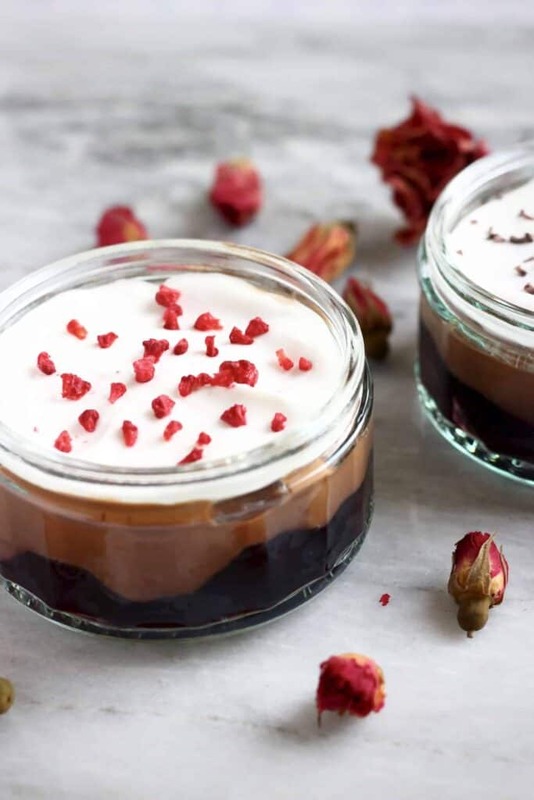 Please make sure to try out this Gluten-Free Vegan Chocolate Cherry Trifle this Christmas season, it definitely won’t disappoint! Love the combination of cherry and chocolate – just like a black forest cake! Made this for an extended family get together (most who are not vegan) on Christmas Day, I also made your vanilla cake and layered it in as well. Amazingly simple and delicious trifle! The whole lot disappeared within no time and received lots of great compliments. Thank you for your great recipes, I used quite a few of your recipes this Christmas and they all turned out great first go with no complications. Yay thank you so much, so glad you liked it! Good idea to add the vanilla cake to it too. Hope you had a great Christmas!